The official symbol of the Romuvan Church of Lithuania on a flag. A pattern of the world tree, Austras Koks ("Tree of Twilight"), also commonly used as a symbol of Romuva. Romuva is a Jonas Trinkūnas until his death in 2014. Bagdonavicius, Vaclovas (2000). "Vydunas: the Essential Features of his Philosophy". In Baranova, Jurate. Lithuanian Philosophy: Persons and Ideas. Council for Research in Values. Baár, Monika (2010). Historians and Nationalism. Oxford University Press. Clark, Terry D. (2004). "Lithuania". In Frucht, Richard; Ellington, Lucien. Eastern Europe: An Introduction to the People, Lands, and Culture. ABC-CLIO. Dundzila, Vilius Rudra; Strmiska, Michael F. (2005). "Romuva: Lithuanian Paganism in Lithuania and America". In Strmiska, Michael F.
Dundzila, Vilius Rudra (2007). "Baltic Lithuanian Religion and Romuva". Ignatow, Gabriel (2007). "Cultural Heritage and the Environment in Lithuania". Transnational Identity Politics and the Environment. Lexington Books. Waldman, Carl; Mason, Catherine (2006). Encyclopedia of European Peoples. Infobase Publishing. ^ Baltų Krivule Kurtuvėnuose 2011.06. 5. ^ a b Dundzila (2007), p. 294. ^ Lietuvos gyventojai pagal tikybą 2001 m.
^ Dundzila & Strmiska (2005), p. 246. ^ Ignatow (2007), p. 102. ^ a b Dundzila (2007), p. 280. ^ a b c d Dundzila (2007), p. 287. ^ Alfredas Bumblauskas, "Lietuvos tūkstantmetis". ^ Dundzila (2007), pp. 287-288. ^ a b c Dundzila (2007), p. 288. ^ Dundzila & Strmiska (2005), p. 242. ^ Dundzila (2004), p. 290. ^ Waldman & Mason (2006), p. 492. ^ Dundzila & Strmiska (2005), p. 244. ^ Barr (2010), p. 179. ^ Dundzila (2007), pp. 279 & 292. ^ Dundzila & Strmiska (2005), pp. 245-246 & 258. ^ a b Dundzila (2007), p. 321. ^ Dundzila & Strmiska (2005), pp. 258-270. ^ Dundzila & Strmiska (2005), pp. 258-260. ^ a b Dundzila & Strmiska (2005), p. 361. ^ Dundzila (2007), p. 292. ^ Bagdonavicius (2000), p. 96. ^ For most of the claims in this paragraph thus far, see Dundzila (2007), p. 293. For Trikūnas' involvement with Ramuva, see Dundzila & Strmiska (2005), p. 246. ^ Faith-based organizations | Education | United Nations Educational, Scientific and Cultural Organization. Unesco.org. Retrieved on 2013-07-28. Romuvan and Hindu groups have come together on numerous occasions to share prayers and participate in dialogue. These events have taken place in Lithuania, Atlantic City, New Jersey, Boston, Massachusetts, Epping, New Hampshire, and elsewhere. Close relations are maintained with various Hindu groups. 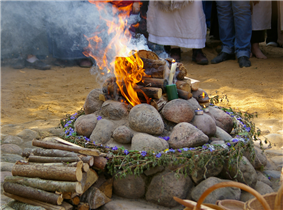 The Baltic aukuras or "fire altar" is a stone altar in which a fire is ritually lit. Participants wash their hands and face before approaching the aukuras, and then they sing dainas or ritual hymns as the fire is lit. Food, drink, grasses and flowers are offered to the flame as the group sings the dainas. After the primary offering, participants offer their own verbal or silent contributions which are carried to the Gods with the smoke and sparks of the flame. Romuva was recognised as an Ancient Baltic faith community in 1992 after independence in 1990. Under the auspices of the Law on Religious Communities and Associations which was passed in Lithuania in 1995, Romuva gained recognition as a "non-traditional" religion. Lithuanian law requires a minimum of 25 years of existence before such a religion can receive the state support reserved for "traditional" religions. In 1990, Trinkūnas created Kūlgrinda band that performs in many Romuva festivals. The Lithuanian pagan movement was stopped by Soviet occupation in 1940. The Soviet Union forcefully annexed Lithuania in 1940 and renamed it the Lithuanian Soviet Socialist Republic. Due to the nationalist nature of Romuva, the faith was suppressed during the Soviet occupation and many practitioners were executed or deported to forced labor camps in Siberia. After Joseph Stalin's death the cultural life became freer. Domas Šidlauskas-Visuomis (1878–1944) began to create Vaidevutybė (Baltic paganism) in 1911. At the same time the Latvian folk religion movement Dievturi was started by E. Brastinis. The main problem was that the first movements were based on limited folklore sources and influenced by Far Eastern traditions such as Hinduism and Buddhism. Even so, the idea of Romuva didn't die during the Soviet occupation of Lithuania. The philosopher Vydūnas is taken as a sort of founding father of Romuva. He actively promoted awareness of and participation in pagan festivals. Vydūnas saw Christianity as foreign to Lithuanians, and instead he brought his attention to what he saw as the spiritual vision of the adherents of the traditional Baltic religion. He ascribed to this a sense of awe in their cosmology, as they saw the universe as a great mystery, and respect for every living being as well as the earth in their morality, as they saw the whole world and every individual as a symbol of life as a whole. The Divine was represented by fire, which was as such used ritually to worship the divine and itself held sacred. Vydūnas had given special treatment to this religion of the Lithuanians in his drama Amžina ugnis (An Eternal Flame). Among this and other works, Vydūnas exalted the faith as being on the highest level of spiritual expression, along with other forms which he recognized. In the beginning of the 20th century, ancient pagan traditions were still continued in folklore and customs. People were celebrating ancient pagan festivals mixed with Christian traditions. Such festivals include Vėlinės (day of dead souls, common with Celtic Halloween), Užgavėnės (festival when winter ends and spring begins), and Rasos or Joninės. For Užgavėnės, people in Samogitia may dress in costumes including masks and burn an idol of an old lady, called Morė or Giltine, goddess of death. The Romantic epoch started in the 19th century. This led Lithuanians to look back to their past for both intellectual and spiritual inspiration. The national revival started and Lithuanian intelligentsia idealised ancient paganism and folklore. Some historians wanted to prove the beauty of ancient polytheism and even started creating new aspects of Lithuanian mythology. One of the most famous of these was Theodor Narbutt who edited Ancient Greek myths and created new Lithuanian ones. Even in the face of Crusaders, by the time of Grand Duke Gediminas, the Grand Duchy of Lithuania expanded its influence until it formed the political centre of a vast and prosperous "pagan Empire". Lithuanians thus survived late into history as appreciable representatives of ancient European paganism, preserving this tradition as the official, state religion until the late 14th and early 15th centuries when Christianity was finally accepted by the states of the Grand Duchy, again for political reasons. Lithuanians were thus the last non-nomadic people in Europe practicing pristine Indo-European polytheism. The Sami, who remained nomadic, were the exception, but they did not form a state of their own or speak an Indo-European language. Unofficially, Lithuanians continued in their adherence to traditional paganism. Beginning in 1199, the Roman Catholic Church declared crusades against Baltic pagans. Grand Duke Mindaugas was Christianized with his family and warriors in 1251 so that the Crusades may be ended by the Church. But Mindaugas still worshiped pagan deities as the Hypatian chronicle mentions. He sacrificed to the pagan Supreme god (*Andajus, later Dievas), Perkūnas, *Teliavelis (god of smiths), and *Žvorūna (goddess of forests and hunters). Despite any insincerity and realpolitik in his Christian faith, some subsidiary states of Mindaugas' Grand Duchy rebelled in protest. In 1261 Mindaugas renounced his Christian faith as his official conversion failed to placate the Crusaders. The adherents of this Baltic religion prospered relatively unhindered until the 9th century when they began to come under pressure from outside Christian forces. The Annals of Quedlinburg mention a missionary, Bruno of Querfurt, who was killed along with 18 men by Yotvingians while attempting to convert the pagans in the area of Lithuania and Prussia in 1009 CE. This was the first time the name of Lithuania was mentioned in written sources. Other sources suggest Bruno had been killed for violating The Holy Forest and destroying statues of gods. Whatever religion the original inhabitants of the Baltic region had predates recorded history. Mesolithic hunters, gatherers and anglers of the region practised a religion focused on their occupations. Marija Gimbutas controversially suggested that agrarian settlers of around 3500-2500 BCE were examples of earth-worshiping Old Europeans. 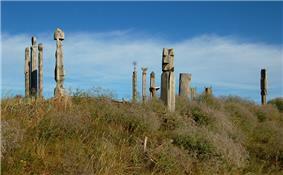 After this, Indo-Europeans entered the area and brought with them their Proto-Indo-European religion. This religion, including elements from the religious past of the region, evolved into the paganism which is attested in the Middle Ages and later. The terms Romuva, Romovė and Ruomuva came from medieval written sources in East Prussia mentioning the pagan Baltic temple Romowe. The word has meanings of "temple" and "sanctuary", but, further, also "abode of inner peace". The Baltic root ram-/rām-, has the meaning of 'calm, serene, quiet', stemming from the Proto-Indo-European *(e)remǝ-.